Ginger's Garden Handmade Lip Balms soothe your lips and add moisture. Treat your lips with some tender loving care. Natural Botanical Lip Balms make unique gifts. I have combined the finest natural and food grade ingredients to help soothe your lips and add moisture. These natural botanical lip balms are flavored and lightly sweetened. The flavor oils that I use are made from natural flavor constituents. Ginger's Garden lip balms are nice and lightweight, yet they will do its job beautifully. Treat your lips with some tender loving care with these lip balms. Each one comes in a swivel up tube. Use as often as needed. Each tube comes shrink wrapped for your protection. Natural botanical lip balms make unique gifts for a Birthday, Easter, Mother's Day, wedding or baby shower favors. This product might melt in extreme heat. It does not affect the formula. Just leave upright until it solidifies again. 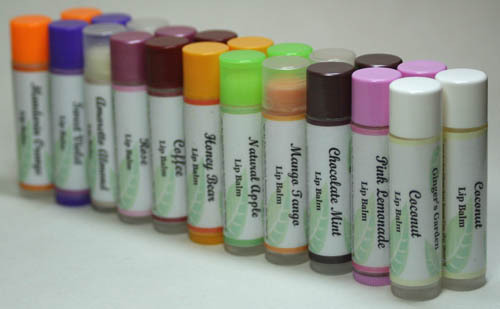 I have more lip balm flavors in another listing. Amaretto Almond, Natural Apple, Coffee, Chocolate Mint, Coconut, Honey Bear, Mandarin Orange, Mango Tango or Rose. Write me a note in the comments section of the shopping cart when you check out. Ingr: Soy Wax (Glycine Soya), Beeswax (Cera Alba), Almond Oil (Prunus Dulcis), Coconut Oil (Cocos Nucifera), Jojoba (Simonsia Chinensis), Mango Butter (Mangifera Indica), Vit. E, Natural Flavor, Sucralose.